These clients found us when they stopped by our booth at the West Michigan Home & Garden Show at DeVos Place in Grand Rapids, Michigan. 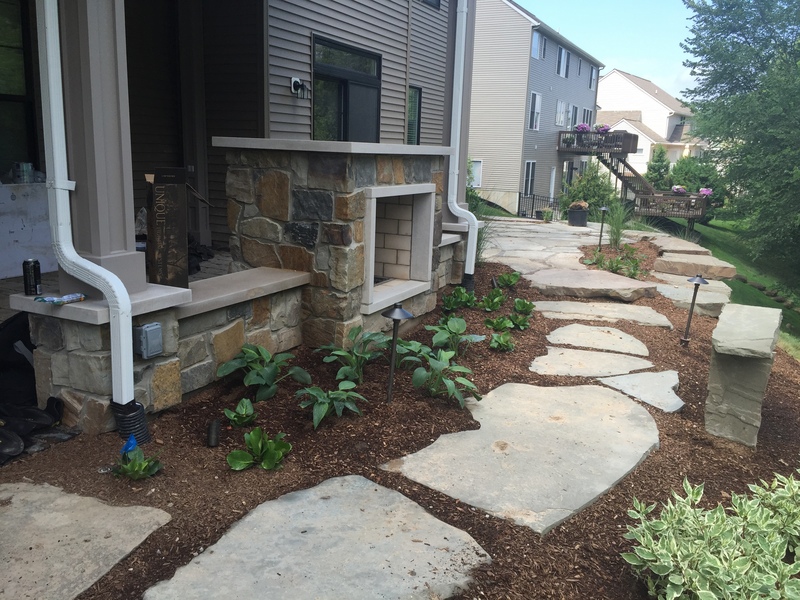 This home was built in a relatively new development in Grand Rapids, while their front yard had some beautiful landscaping, they were not happy with the backyard. Their home is situated on a slope, and a few feet from the walkout basement the the slope increases pretty drastically. 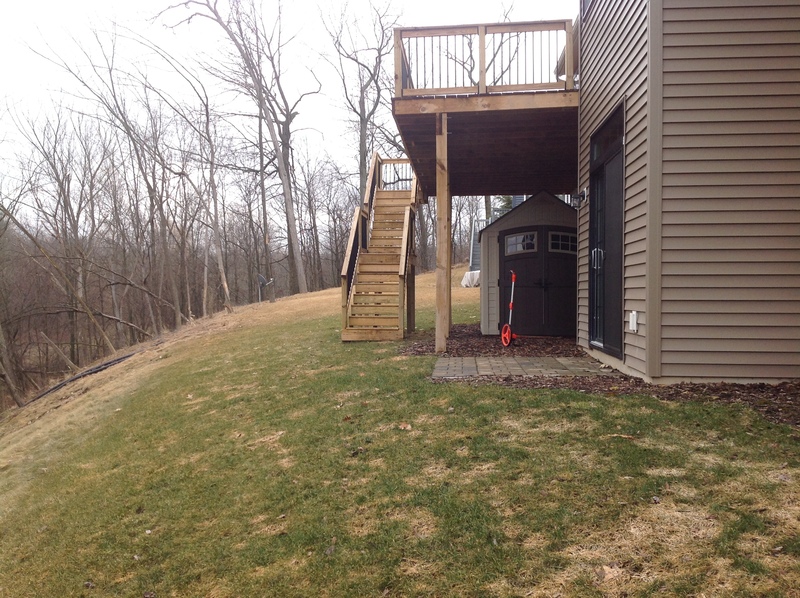 They were not happy with their existing deck, and wanted usable space underneath the deck. Since this was a newer development without many mature trees, these Grand Rapids home owners were also looking for a way to create privacy. 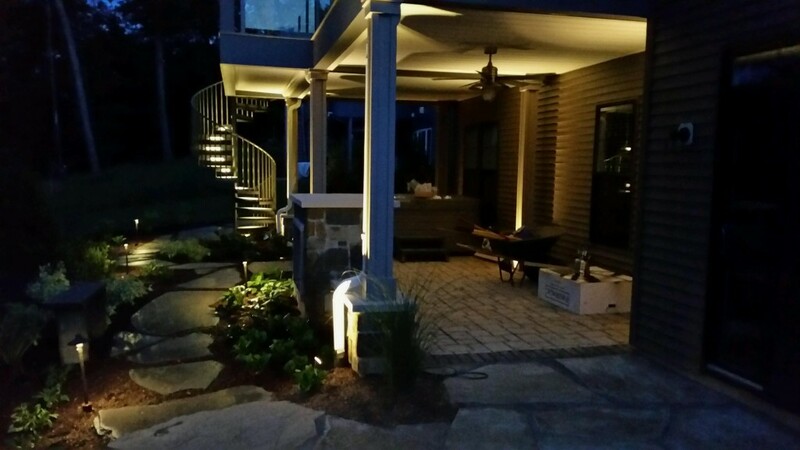 The biggest challenge was the slope, and being able to create a functional outdoor living area, that would optimize the usable space available. 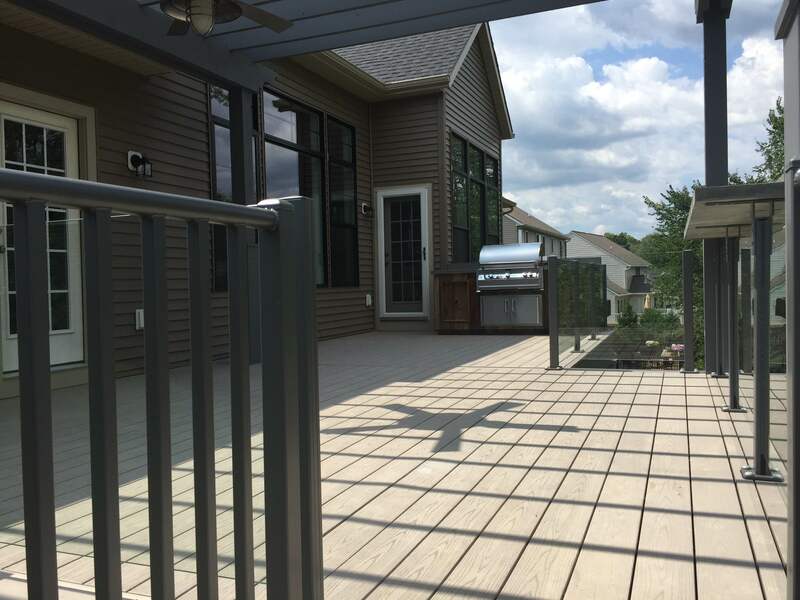 New Redesigned Deck – This was top priority for these Grand Rapids homeowners. 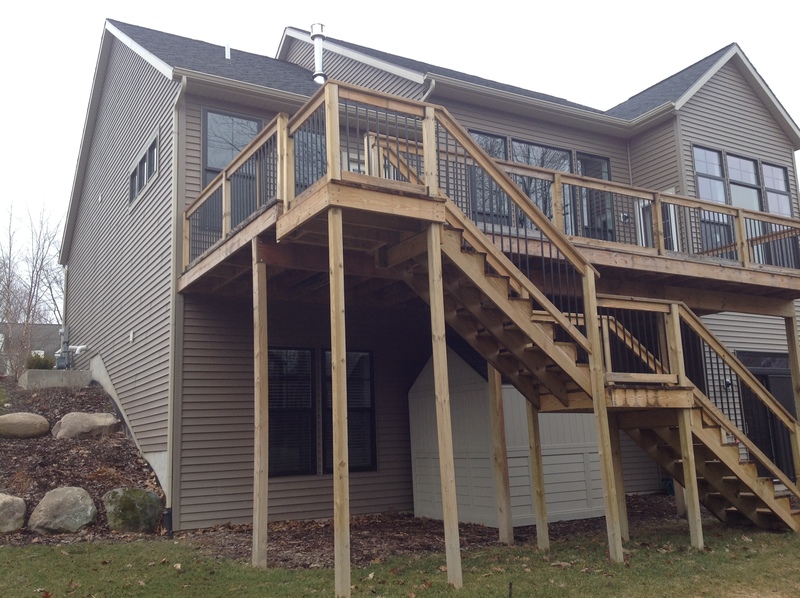 We used a composite decking to extend the life of the deck. 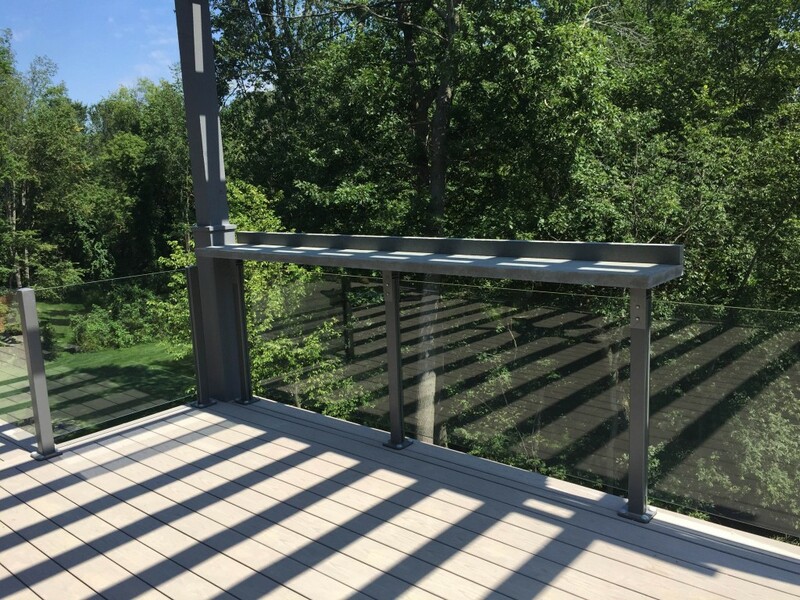 Since the homeowners wanted to take advantage of the scenery in their backyard we decided a glass railing would be a perfect option for them. Pergola – For just the right amount of shade we added a pergola along with an outdoor fan to move the air around on those hot summer days. Built In Grill – The homeowners love the feel and look of the ‘rustic’ style. What better way to show off their rustic style than with a built in grill made from reclaimed barnwood. We added two bluestone pieces to the front of the grill for that added touch, these bluestone pieces also have lighting behind them to stand out at night. Overlook – A small overlook was added near the staircase; where you can pull up a chair and your favorite drink, and sit back to enjoy the scenery. bluestone tread piece to light your way up or down the stairs. New Patio Under Deck – We used a simple design with contrasting patio pavers under the whole deck. This allowed the homeowners to finally install their hot tub! Since summers can be hot and humid around these parts, we added outdoor ceiling fans to move the air along. See Through Fire Place – Likely our second favorite part of this Grand Rapids Outdoor Home Improvement Project was the see through fireplace. The fireplace was built in such a way, that it would support the columns for the deck. Normally fireplaces can only be enjoyed on one side, and rarely can you see through it. A gas fireplace that the homeowners could see through was perfect, so they would be able to relax while watching nature in their backyard. We also made a small bench, made out of bluestone, on the opposite side of the fireplace. Walkout Patio – A simple flagstone patio, large enough for an outdoor dinning table and chairs, was created to add to the rustic style these homeowners craved. Landscape Plants – We used many native species on this property, partly because of ‘nature’ that comes by and likes to have dinner. Many of the plants we used are deer resistant and quite hardy. We also included a screening of shrubs around the hot tub area for the added privacy the homeowners were looking for. 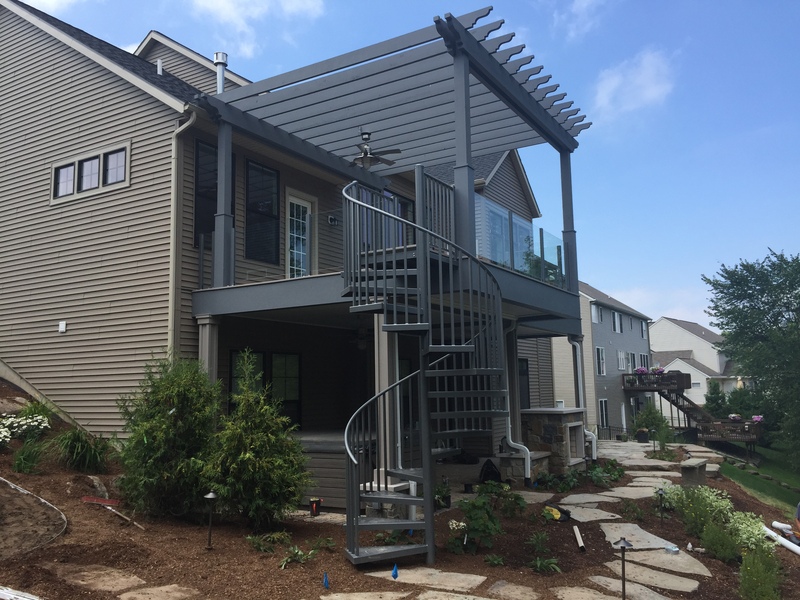 Check out the before an after photos, along with a quick video overview of this awesome Grand Rapids Outdoor Home Improvement Project! Are you ready to get started on your next project?